The Templeton Community Services District was formed on December 29, 1976, under the Community Services District Law of California. A special district is a separate local government that delivers public services. In the case of a community services district, the residents and property owners receive multiple services. 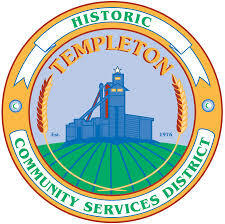 Templeton CSD provides water, sewer, fire protection, parks and recreation, street lights, refuse and recycling services within the limits of its approximately 3.5 square mile service area. The Board of Directors and employees of Templeton CSD – the District is supported by a dedicated staff of 20 – take great pride in administering these responsibilities. The District strives to provide services in the most cost-effective and efficient manner possible in an effort to maintain and enhance the quality of life for our residents and businesses. The legislative head of the District is a Board of Directors composed of five members – President Greg O’Sullivan; Vice President David LaCaro; and Directors Judith Dietch, John Gannon, and Geoff English. Board members serve a four-year term; elections are held every two years, on odd number years. The District holds two monthly meetings of the Board of Director on the first and third Tuesday evenings at 7 p.m. in the District Board meeting room, located at 206 5th St. in Templeton. Committee meetings and workshops are also held to discuss specific topics of interest and concerns. Residents and property owners are encouraged to attend meetings to learn more about District proceedings, and to add objective thought. For more information, call the District office at (805) 434-4900 during regular business hours. Reference the Templeton CSD website at www.templetoncsd.org for additional information including: on-line bill pay, calendar of events, meeting notifications, Activity Guide, facility reservations and more.